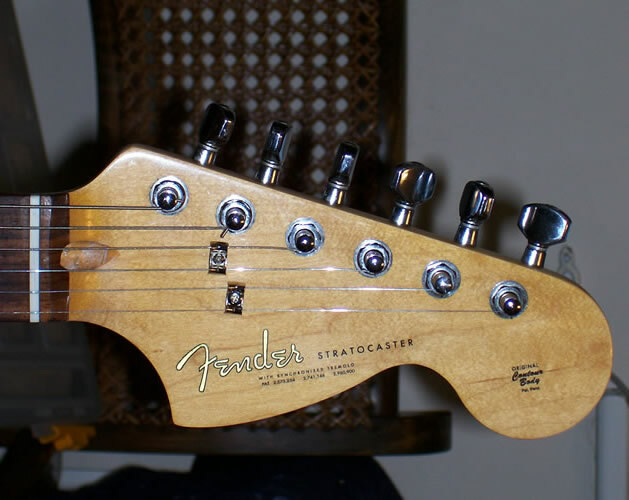 A few years ago, if you needed a replacement headstock decal, you either bought one from the Original manufacturer or one of the early copy decals available through the internet. These copy decals are obviously cheaper than the originals but came with a few problems. There are now a number of versions available, all of which I’ve tried, so for your benefit I would like to share my experiences with you. The first decals available were the ‘Patch’ type, where you have the logo only. 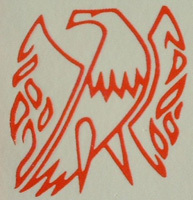 This came as a clear waterslide transfer with the logo printed by an inkjet printer or a computer cut self adhesive vinyl. Once applied you simply sprayed lacquer over the top and ‘bury’ the logo. The only problem was the early waterslides tended to be quite thick so always showed a protruding edge around the cut out. The vinyl’s were even thicker and tended to melt if you used a cellulose based lacquer, which most restorers/finishers do. The early waterslides were very delicate, and if the ink was not ‘fixed’ could run when the backing paper was soaked off, they also curled up if left in the water too long and shriveled up if one was too impatient with the lacquer. As they were ‘patches’ if you had more than one decal to apply then obviously they came separately and so presented positioning and lining up problems. The current waterslide patch decals are much better. The transfer is much thinner and pre-coated with a thin layer of nitro cellulose lacquer. This fixes the ink and makes them easier to handle, less likely to curl up in water and being less delicate, are easier to position once on the head stock. I would recommend this form of decal and not the vinyl type for your headstock, but ok on your amp or case, anywhere that you are not going to lacquer, although they do take varnish. This is the only type of waterslide decal that we now use. Each headstock decal has been carefully recreated based on actual vintage models from the 1950's through the 1970's and replacements for modern models, using real metallic Silver or Gold ink. Our waterslide decals are the perfect replacement for any repair or restoration project. Our decals are not from the original manufacturers, but in most cases they are more vintage accurate than the replacement decals currently available elsewhere. Please note we have no association with Fender, FMIC or Gibson. Best waterslides I have ever worked with.. Thanks for getting them to me so quick!! today I received the decals ... they are superior quality ... and thanks for the turbo-fast delivery! If I need more logos or decals, I will definetely order them from you! I got the decal yesterday and slapped it on last night. Thanks for such a great decal. The instructions really helped too. I've needed this decal for 35 years for my 1954 Jr. and it looks very nice on there. Now to build up some lacquer and put it back together. Received your package yesterday 10/25 [unexpectedly fast turnaround] and neither of our postal services managed to bugger-up the goods in transit which I guess means there is a god after all and he does perform the occasional minor miracle.The decal/transfer looks great – very nicely done! Couldn’t have asked for or expected a better job. Should I embark on another one of these projects in the future I’ll definitely keep your services in mind. recieved decal today, (very fast), GREAT JOB. Just a note to say thank you for the excellent service. The decal arrived promptly, well packaged and with great instructions for applying / getting a great finish. Looking forward to restoring my guitar to its former glory. Outstanding logos and service! Allready arrived! Thanks a lot, will definitely order again! 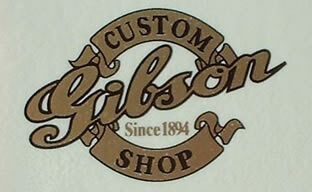 I received my Gibson repair decal right away and it is of high quality, as always. Very correct for the vintage once some toning lacquer goes over the top. Thanks for the great service. Received the decal today - many thanks! Very friendly and efficient service. I will be recommending you to all of my friends & family.